Everyone knows what a follower of Flambeau is like... a master of Ignem magic, a maestro with Pilum of Fire. Apart, that is, from those Flambeau who choose to wield mundane weapons, or who control the powers of darkness and cold. And Tytalus magi are renowned for weaving intricate plots in society, manipulating those around them. Except for those exceptional few who live alone, testing themselves against the natural elements, of course. 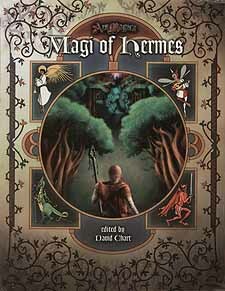 Magi of Hermes presents fifteen fully detailed magi who redefine the norm for Ars Magica. From the rare to the extraordinary, you'll find them here with statistics given every fifteen years throughout their careers. And also included are the specifics for their magical creations, both spells and items, which are often as remarkable as they themselves are.